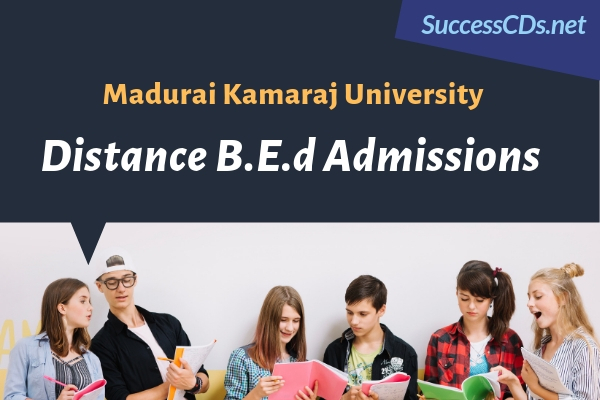 MKU DDE B.Ed Admission 2019 - Applications are invited by Madurai Kamaraj University (MKU), Directorate of Distance Education (DDE), Madurai for admission to 2 years distance Bachelor of Education (B.Ed.) Program for the session 2019-21. The Bachelor of Education (B.Ed) Program of Directorate of Distance Education, Madurai Kamaraj University, aims at developing knowledge attitude and skills required by practicing teachers for effective teaching-learning process at the secondary level. The Program provides opportunities of sharing experiences gained by practicing teachers. It enables in-service teachers to select and organize learning experiences according to the requirement of learners. The duration of the program is two years. A student has to complete his/ her program within five years. For candidates belonging to OC, BC, BC (M), MBC/ DNC, SC/ SC (A) ST Communities and Handicapped (both physical and visual) will be made as per the rules and regulations of Govt. of Tamil Nadu. The envelope should superscribed as “Application for Admission to B.Ed.